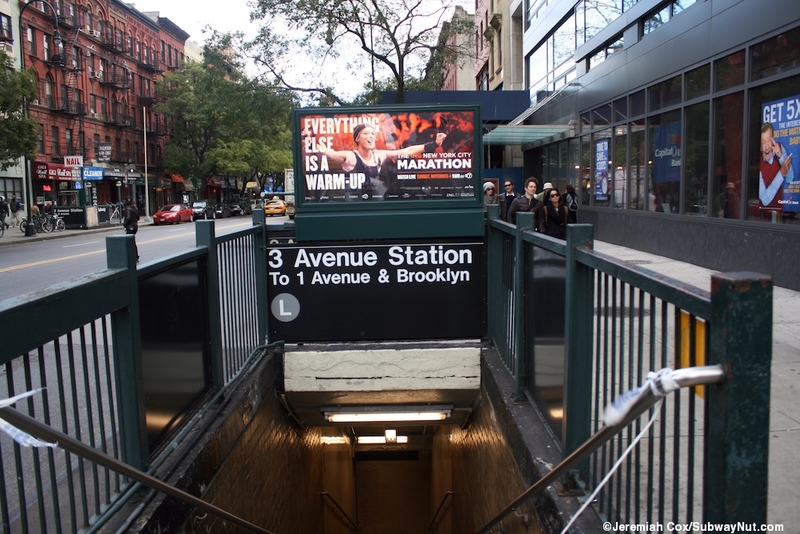 Third Avenue is a typical 14th Street-Canarsie Line local stop. 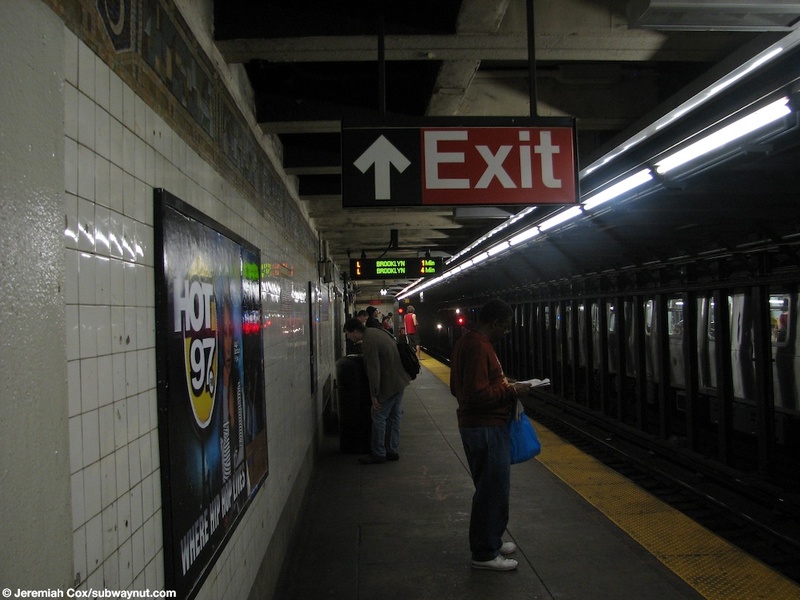 It has two side platforms each with only one exit towards their Western ends and just 3 turnstiles to leave the station. 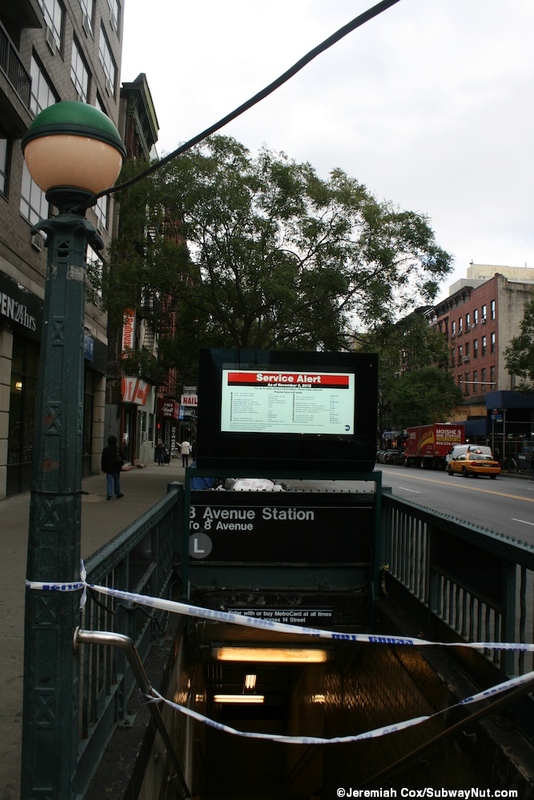 The 8th Aveune-bound platform has had its token booth removed, is unstaffed and its streetstair is out to the NE corner of 3 Avenue and 14 Street. 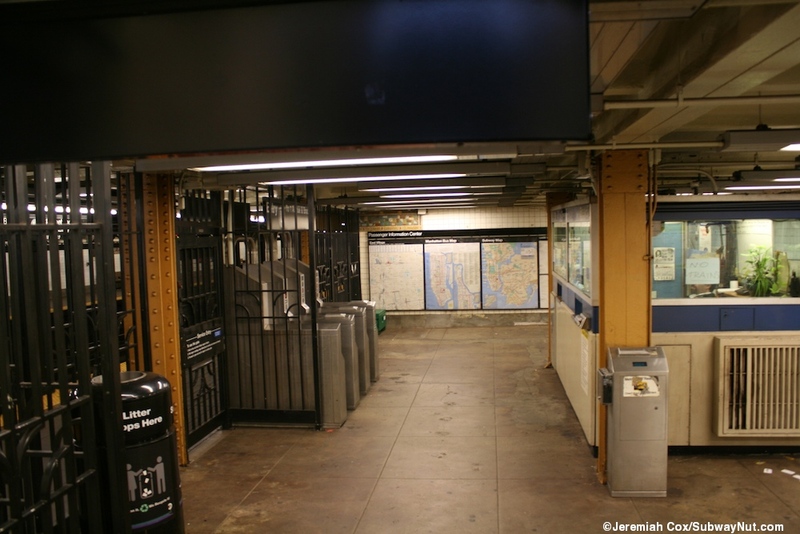 The Brooklyn-bound platform has the token booth and a streetstair to the NW corner. 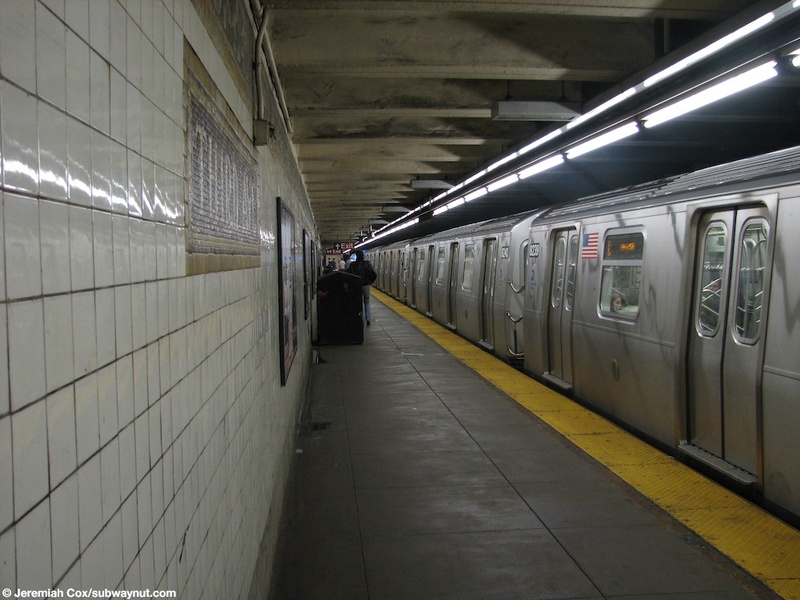 The side platforms are narrow enough that there are no support beams on them; the only ones are between the line's two tracks. 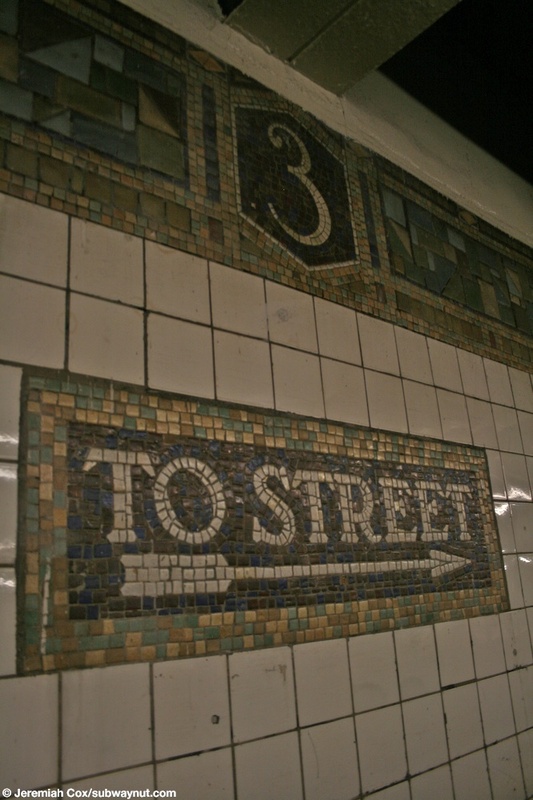 It has grey name tablets with a complex squares trimline and little 3s in the trim. 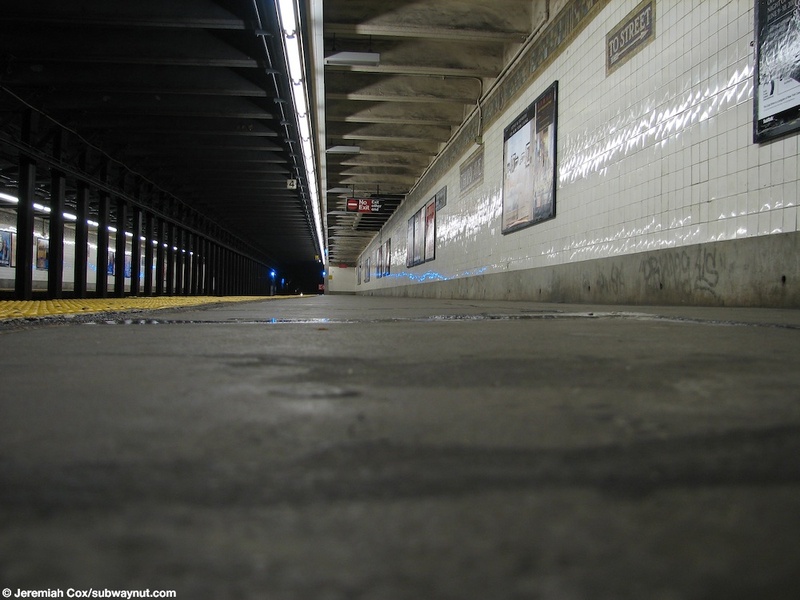 (3l1) Looking down the Brooklyn-bound platform at Third Avenue as a R143 L train has closed its doors. 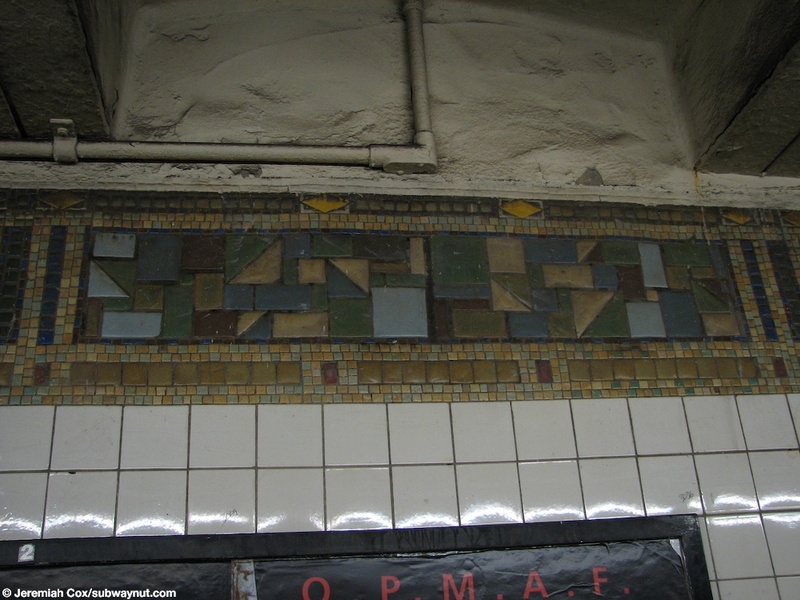 21 April, 2007 (3l3) The detailed mosaic work in the station's trim at Third Avenue. 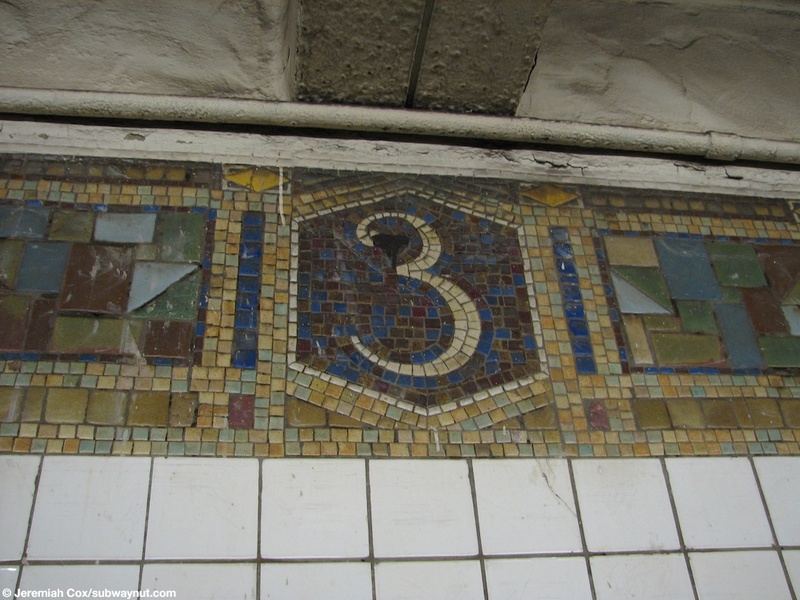 21 April, 2007 (3l4) A mosaic 3 in the trim at Third Avenue. 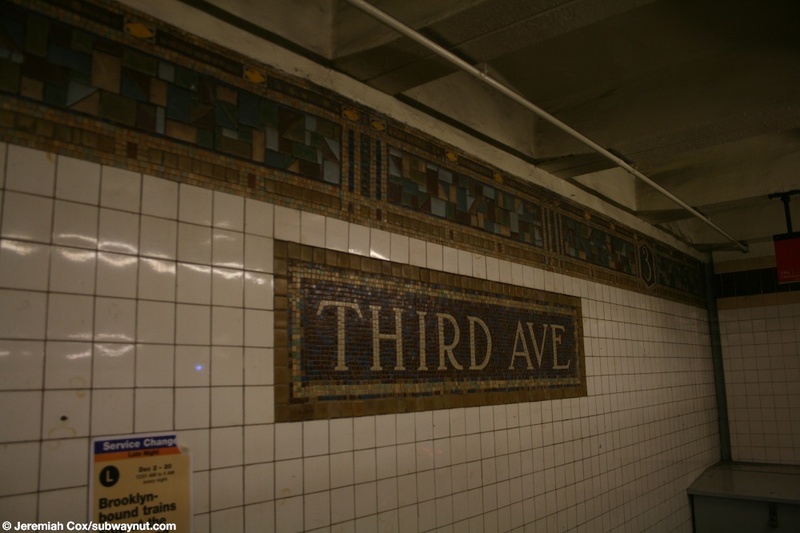 (3l5) A wider shot of the station wall at Third Avenue a mosaic 3 and a mosaic To Street are visible. 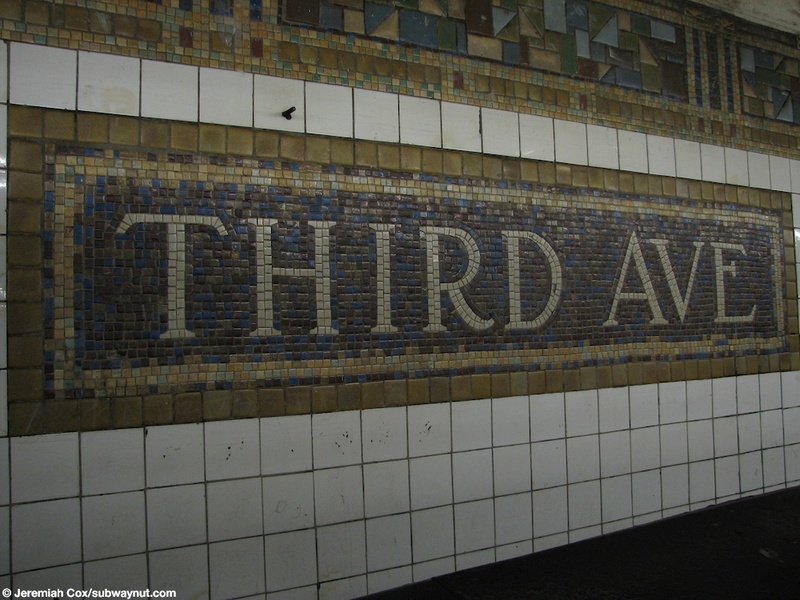 21 April, 2007 (3l6) A Third Ave name tablet. 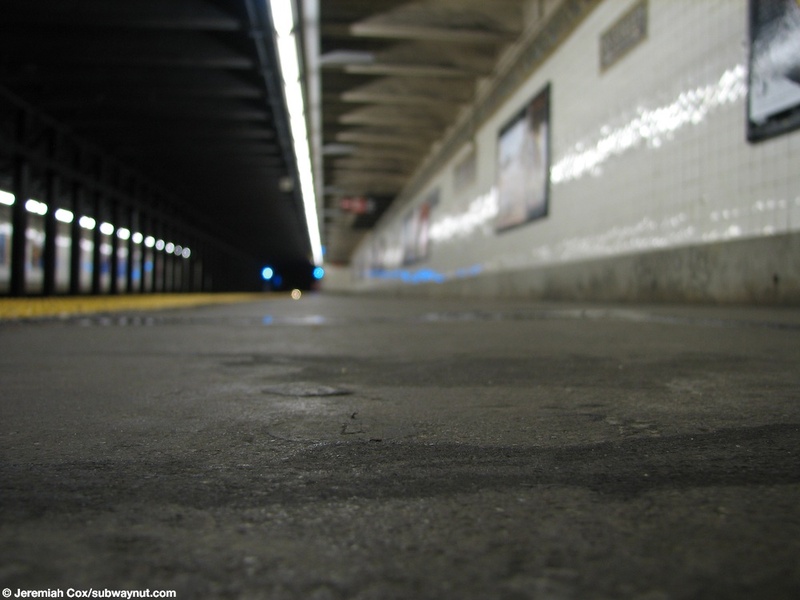 21 April, 2007 (3l7) Looking down the simple old platform floor at Third Avenue. 21 April, 2007 (3l8) Another view down the platform floor at Third Avenue. 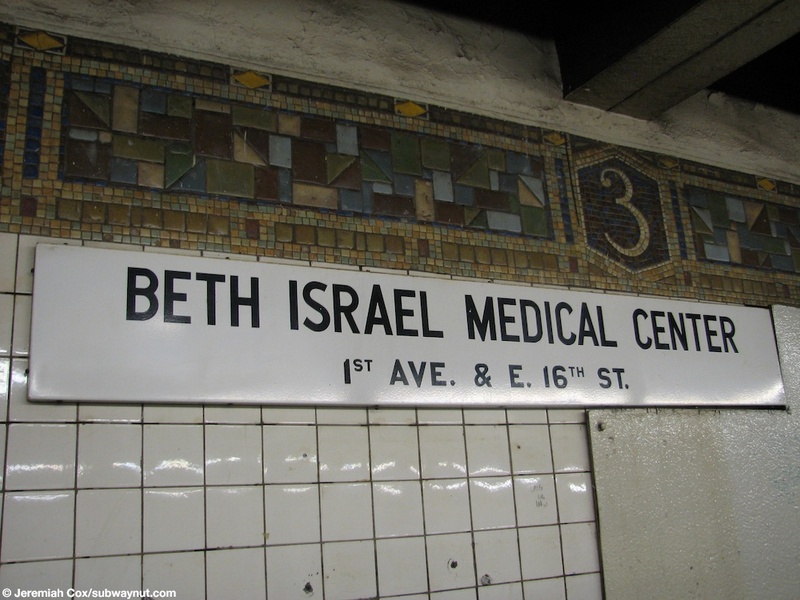 (3l9) An old black text on white sign for Beth Israel Medical Center at 3rd Avenue (1st Avenue stop would be much closer). 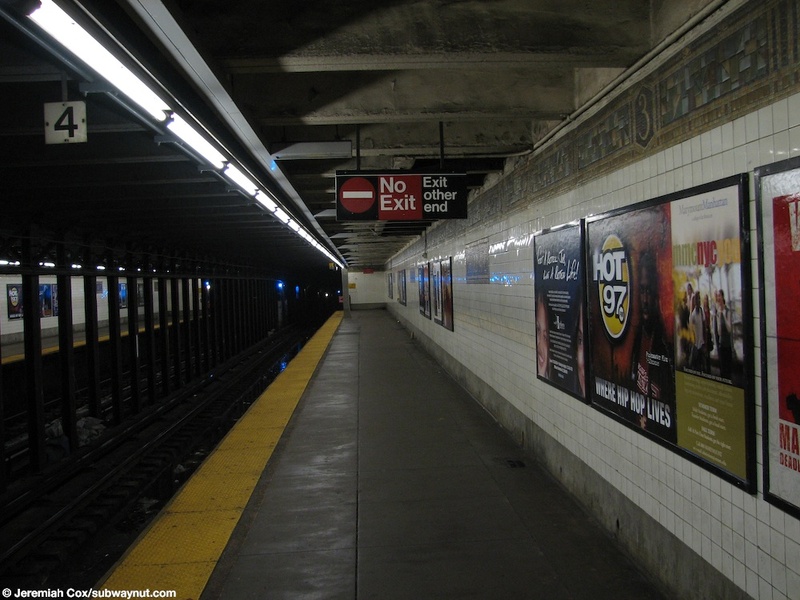 21 April, 2007 (3l10) Looking down the Brooklyn-bound platform at 3rd Avenue as it begins getting crowded with people waiting for the next train. 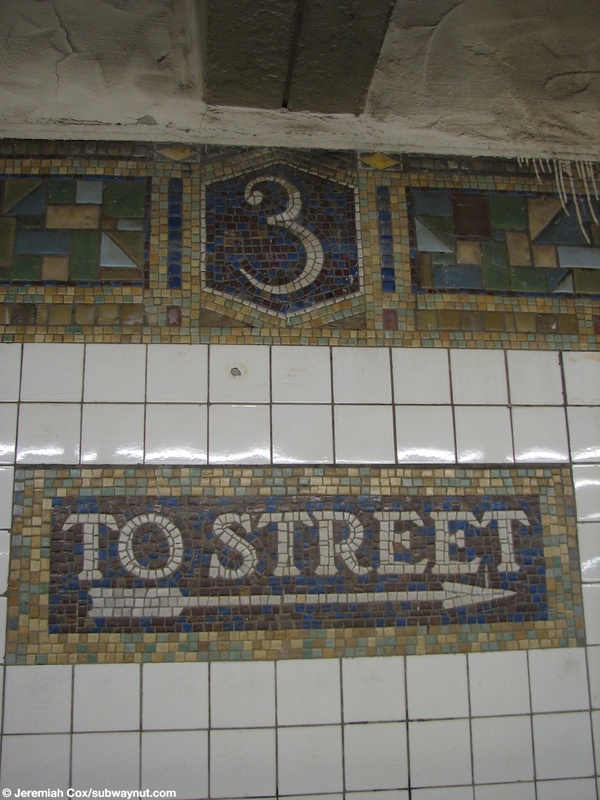 21 April, 2007 (3l11) A two street mosaic beneath a mosaic 3 in the trim at Third Avenue. 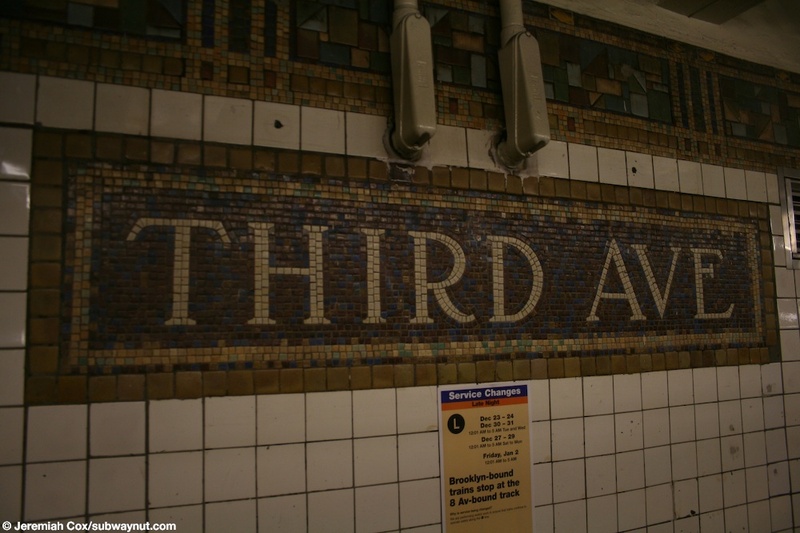 22 December, 2008 (3l12) A name tablet at Third Avenue. 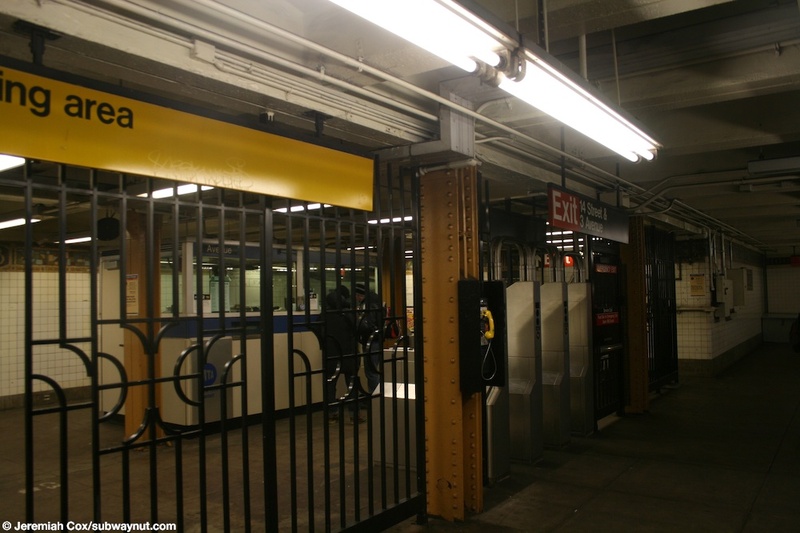 (3l13) The fare control area with its 3 turnstiles on the Brooklyn-bound platform at 3rd Ave.
22 December, 2008 (3l14) A Third Ave name tablet at the very end of the Brooklyn-bound platform.